North Korea has hailed Kim Jong-Un as “supreme leader of the party, state and army” after his father’s funeral. Kim Jong-Un took centre stage at a memorial service in Pyongyang’s main square a day after his father’s funeral. Kim Yong-Nam, formally the number two leader, told a million-strong crowd their sorrow would be turned into strength “1,000 times greater under the leadership of comrade Kim Jong-Un”. State TV showed Kim Jong-Un surrounded by top government and army officials. The memorial event appeared to be the Kim dynasty’s unofficial handover of power. A three-minute silence was also held, after which trains and ships throughout the country sounded their horns. Kim Jong-Il died of a heart attack on 17 December, aged 69, state media said. He had ruled North Korea since the death of his father Kim Il-Sung in 1994. “Respected Comrade Kim Jong-Un is our party, military and country’s supreme leader who inherits great comrade Kim Jong-Il’s ideology, leadership, character, virtues, grit and courage,” Kim Yong-Nam told the massive crowd gathered in Kim Il-Sung square. A top military official, Kim Jong-Gak, also addressed the crowd. “Our people’s military will serve comrade Kim Jong-Un at the head of our revolutionary troops and will continue to maintain and complete the Songun accomplishments of great leader Kim Jong-Il,” he said. Songun refers to the “military-first” policy – channeling funds into the military. On Wednesday, thousands stood weeping and wailing in the snow as Kim Jong-Il’s funeral cortege passed, images from state television showed. The ceremonies echoed the displays of pomp and military might that marked the death of Kim Il-sung, in 1994. 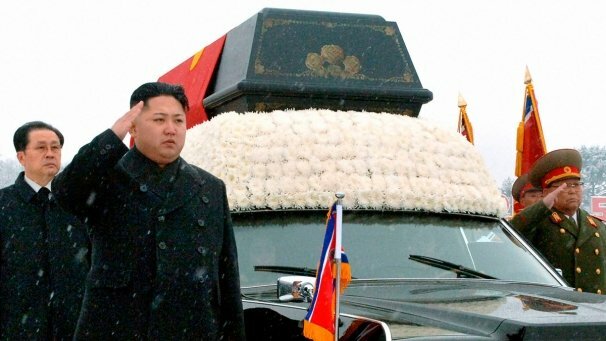 Kim Jong-Un – Kim Jong-Il’s third son – cried as he walked alongside the hearse. Tens of thousands of soldiers lined up to bow their heads in homage in the city’s main square. Kim Jong-Un – who is thought to be in his late 20s and who has little political experience – was accompanied by his uncle, Chang Song-Taek. Chang Song-Taek is expected to be a key player as the younger Kim Jong-Un consolidates power. Kim Jong-Il – known in North Korea as the “Dear Leader” – was in the process of formalizing Kim Jong-Un as his successor when he died. However, the transition was not complete, leaving regional neighbors fearful of a power struggle in the nuclear-armed pariah state. Kim Jong-Il’s two older sons, Kim Jong-Nam and Kim Jong-Chol, were not seen at the funeral. No foreign delegations have attended any of the events. However, UN offices around the world lowered their flags to half-mast. A spokesman at the UN headquarters in New York said that the move had been requested by Pyongyang’s UN mission but was part of normal protocol for the funeral of any head of state.